A million units equals a million reasons why the QLn Series made its mark in retail history. Now, it's doing it again, as the ZQ600 Series mobile label printer. 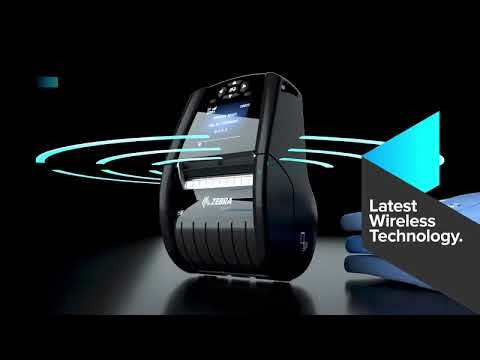 The Zebra ZQ600 Mobile Label Printer Series delivers all the features needed to maximise associate productivity and customer service. Shop associates can print everything from shelf labels to item tags, markdown labels and sales receipts, right on the spot. This premium mobile printer takes productivity, ease-of-use and manageability to a new level with a large colour display, fast 802.11ac and Bluetooth 4.1 wireless connections, class-leading battery technology and powerful remote management tools. The ZQ600 Series features the highest battery capacity in its class with a 3250 mAH battery to ensure associates have plenty of power for every shift. The patented Power Smart Print TechnologyTM ensures the exact amount of power required is delivered for the highest quality printing and PowerPrecision+ technology makes it easy to identify ageing batteries before they impact productivity. Standard printer battery for use with the ZQ610 / ZQ620 Series which can be polled and managed to monitor battery health and recommend replacement. Standard printer battery for the use with the ZQ610 / ZQ620 HC which can be polled and managed to monitor battery health and recommend replacement. Hand strap which allows the printer to be carried by hand, like a toolbox. Add an extra layer of protection for harsh environments with a soft case. While in the case, the printer is IP54-rated resistance to windblown water and dust. Case provides openings for changing the media and batteries and all connectors are accessible. Dock and charge a single ZQ610 / ZQ620 or a QLn220 / QLn320 printer on a tabletop / counter top surface. Ethernet allows the printers to be managed remotely. Power supply and UK line cord ships with the Single Ethernet Charging Cradle. Connect the printer (or charging cradle) to AC power to charge the printer’s internal battery. Add an extra layer of protection for harsh environments with a soft case. While in the case, the printer is IP54-rated resistance to windblown water and dust. Case provides openings for changing the media and batteries and all connectors are accessible. Includes shoulder strap. Docks and charges up to four ZQ610 / ZQ620 or QLn220 / QLn320 simultaneously. Allows remote unattended management. Provides two Ethernet ports for daisy chaining up to four 4-Slot Ethernet Charging Cradles. Mounting kit which allows you to secure a 4-Slot Ethernet Charging Cradle to a wall. Serial Cable adapter which allows legacy QL cables to be used with ZQ600 and QLn. Cable connects from a ZQ600 and QLn to PC for serial communications. Serial cable which connects the ZQ600 and QLn to MC9000 Series Handheld Mobile Computers. USB cable for connecting the ZQ600 and QLn to PCs / laptops. Prevents USB cable breakage via hard plastic twist lock. Serial cable for connecting the ZQ600 and QLn to an LS2208 scanner. Serial cable for connecting the ZQ600 and QLn to MC3000 Series Handheld Mobile Computers. Serial cable for connecting the ZQ600 and QLn to RJ-45 serial devices. Prevents breakage via a hard plastic twist lock. Extended Li-Ion battery with LED and twice the capacity for use with the QLn220 / QLn320 and ZQ500 Series. NOTE: LED indicates when the battery is beyond useful life / due for replacement. Offers over-the-shoulder carrying option. Connects via looping strap. Metal stand for storing the printer in upright orientation. NOTE: This is not intended for use on mobile carts. 12-24V DC power supply charges the printer via vehicle lighter power adapter. Connects to barrel jack on printer, or on the single slot printer charging cradle. Connect the printer to AC power to charge the printer’s internal battery. Compliant with Healthcare standard IEC60601 for use in patient rooms. Disinfectant ready shoulder strap for healthcare environments; offers over-the-shoulder carrying option. Connects via looping strap. Docks and charges a single PowerPrecision+ Li-Ion printer battery. Integrated power supply. Ships with EU line cord. NOTE: Works with both standard and extended battery packs. Docks and charges a single PowerPrecision+ Li-Ion printer battery. Integrated power supply. Ships with UK line cord. Dock and charge up to three PowerPrecison+ Li-Ion printer batteries at a time. The 3-slot battery charger ships with a power supply and EU line cord. Dock and charge up to three PowerPrecison+ Li-Ion printer batteries at a time. The 3-slot battery charger ships with a power supply and UK line cord. Dock and charge up to six PowerPrecision+ Li-Ion printer batteries at a time. The dual 3-slot battery charger ships with a power supply, Y-Cable and EU power cord. Dock and charge up to six PowerPrecision+ Li-Ion printer batteries at a time. The dual 3-slot battery charger ships with a power supply, Y-Cable and UK power cord.